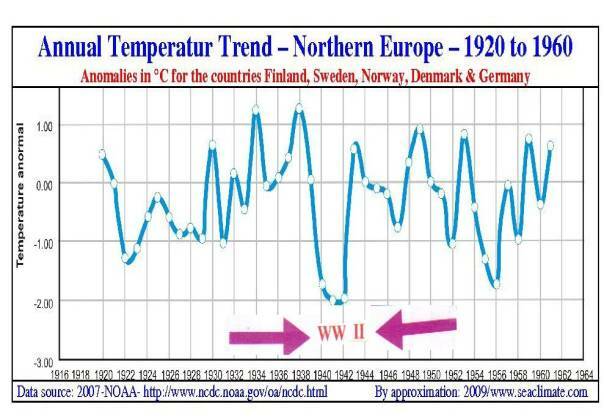 Three war years generated very low annual temperatures in Northern Europe: 1940, 1940 & 1941. A further strong indication of the enormous impact the Second World War (WWII) had on weather modification and climate change can be found if one reviews the first three war years, and their corresponding winters of 1939/40, 1940/41 and 1941/42, as a ‘package’, which means, that there had been these winters occurring in succession, which is highly unusually. The image shows the annual temperature deviation from the long term average, which had been caused by the corresponding arctic winter conditions. For two and a half years, from September 1939 until spring 1942, the war at sea had been largely confined to Europe’s seas or close-by waters. Most of the military activities took place in the Baltic Sea, the North Sea, the Eastern part of the North Atlantic and the Mediterranean Sea, which can be regarded as an evidential indication that naval war had contributed to the extreme low temperatures during the first three war years. This changed completely within a few months after Japan’s attack on Pearl Harbour on December 7th, 1941, and when the United States joined the Allies as a party in war against Japan and Germany. The picture of the war at sea changed dramatically, when it became global and entire areas of the North Atlantic and North Pacific became major battlegrounds. The war machinery increased to dimensions anyone could have hardly imagined prior to the Pearl Harbour event. The global war at sea from 1942 to 1945 is discussed in chapters: ‘Oceans at war’, and ‘Ocean system affected’.